Austin Peay finished seventh overall with 50 total points, just six behind Southeast Missouri. Tennessee Tech won the event with 137 points, outpacing Eastern Kentucky (106) and host Eastern Illinois (78). First up for the Govs on Saturday was the 60m hurdles, and with freshmen Lennex Walker and Denia Hill-Tate in the mix for the finals, Austin Peay had two chances to pick up big points. Walker snagged her first medal, a bronze, in OVC Championship competition, finishing third with an 8.76 mark. 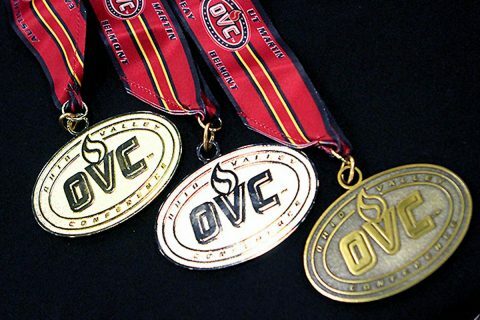 She’s the first Governor to medal in the short hurdles during the OVC Indoor games since Amanda McCoy won the 55m hurdle event at the 2010 OVC Indoor Championships. Hill-Tate, meanwhile, placed sixth, lowering her personal-best to 8.90. Austin Peay’s other piece of hardware for the day came courtesy of sophomore Tymeitha Tolbert in the 60m dash. The Louisville native’s school-record 7.55 mark lowered the mark another two-hundredths of a second, which was set in last year’s OVC Indoor prelims by sophomore Diamond Battle and equaled by Tolbert during Friday’s qualifying round. Tolbert’s bronze marks the fourth time in five seasons that Austin Peay has placed a student-athlete on the medal stand of the 55/60m events during the indoor championships; she takes a place on that list alongside longtime standouts Kymmalett Ross (gold, 2016) and Erika Adams (bronze, 2015; silver, 2014). Battle also secured two points for the Govs, finishing seventh in the finals with a 7.80 mark, one-hundredth of a second behind Eastern Illinois’ Darneisha Spann. Two Govs secured much-needed points in the finals of the 400m event, with freshman Sabrina Richman (seventh, 58.01) and sophomore Amelia Thiesing (eighth, 58.24) each reaching the finals and putting up big times in the process for the Govs. In Saturday’s final event, Austin Peay sent out a 4x400m squad featuring Thiesing, Richman, freshman Allana Johnson and sophomore Allysha Scott—the same quartet which had secured Austin Peay’s season-best 3:55.93 mark at the Thundering Herd Invitational in Huntington, West Virginia, January 27th. With Thiesing leading off and Scott running the anchor leg, Austin Peay posted a blistering 3:55.03 mark in the event, finishing third in Section Two and fifth overall to add four points to the team tally. The Govs will take a week to unwind from the grueling indoor schedule before picking back up with the beginning of the outdoor slate, March 9, with the Coastal Carolina Invitational in Myrtle Beach, South Carolina.